A biographical account of the friendship forged between Charlie Chaplin and writer James Agee, Chaplin and Agee offers an enjoyable look at their intermingling lives during the 1940s through early 1950s. In the midst of an increasingly hostile society plagued by the Red Scare, the duo provides a not-so-gentle reminder that the “good old days” actually weren’t all that good. The book concludes with a never-before-published screenplay treatment Agee wrote specifically for Chaplin’s Tramp character, who survives an atomic blast and lives on in a brave new world all his own. Agee was a star writer whose film reviews and articles appeared in the magazines Time, Life, and The Nation. A poor dresser, he lived the life Bohemian and his dress code matched his laid back lifestyle. Dressed in a well-worn outfit heavy on the color black, he created a mini-scandal on the lot of 20th Century-Fox, where the proper attire for a screenwriter was essentially yuppie, bright, and clean, very clean. Agee was an alcoholic and his love of the hard stuff would prove to be his undoing. But along the way, there were plenty of wives and affairs. His was a colorful world that loved the classic, silent black & white comedies of Chaplin and Keaton. Initially, he despised those new-fangled talkies but, even so, he would go on to write narration for numerous movies and craft his own talkie screenplays. As a lifelong fan of Chaplin, Agee would eventually follow his bliss, leave the New York journalism scene, and pursue a career in Hollywood. His efforts would pay off big time as he befriended his idol and a whole bevy of movers and shakers. Major supporting roles in author John Wranovics’ mini-saga of film history are filled by Ed Sullivan, who, by way of McCarthyism and the Red Scare, rabidly pursued the destruction of Chaplin’s career, and John Huston, who formed a strong friendship with Agee while the pair worked on the screenplay for The African Queen. Making the proceedings in this fairly lively account all the more intriguing are cameo appearances, in some shape or form, by the likes of Stanley Kubrick, Orson Welles, Richard Nixon, Bertolt Brecht, Arthur Miller, Ray Bradbury, H.G. Wells, the Rolling Stones, Greta Garbo, Buster Keaton, and loads of Nazis and Communists. “Maybe friends shouldn’t write about each other until they’re dead – both of them,” Huston once commented to Agee following a moderately critical article Agee wrote about his somewhat difficult director friend. Along those same lines, maybe writers should be careful about writing about other writers lest their style pale in comparison to their subject. Such is the case with Wranovic, who, while keeping things light and quick-paced, lacks a compelling writing style. This account could use some of Agee’s own poetic flourish and dressing – outside the quotation marks. Most annoying is Wranovics’ penchant to repeatedly re-associate recurring members of the “supporting cast” with references already made to their significance. 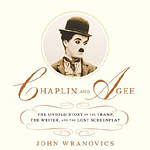 Chaplin and Agee is a rather brisk read and such frequent references are not necessary. As for Agee, the man could on occasion careen close to being a cross between a sycophant and a psycho fan, but he always wrote from the heart and he could always provide a sound, rational defense of his lionizing Chaplin reviews. Many of today’s top critics, who harbor favoritism without defense, would be hard put to accomplish such a task. While the biographical portion ends with Agee’s death and Chaplin in European exile, the book continues on with Agee’s full story treatment for his big idea: to feature Chaplin’s Tramp character in a post-atomic satire. The setting is New York City, after the forces of the fictional country of Obnoxia drop the A-bomb on the Big Apple. Developing in this post-apocalyptic world are two Utopias: one is humanitarian (the one in which Chaplin and his rag-tag collection of acquaintances inhabit) and the other is materialistic (inhabited by a gaggle of scientists). In the Tramp’s world, the simple pleasures of Central Park or an abandoned arcade are shared with a girl, a baby, and a character referred to as Solid Man. All the humanitarians are unrelated and they have no choice but to think – and fend – for themselves. On the other hand, the scientists are a sorry lot. For them, their brain and god is the computer. They struggle to think for themselves, even regarding the smallest of matters, right down to ear scratching. Things in the materialistic Utopia go to heck when the computer crashes thanks to a mouse inhabitant (this would be the real, actual mouse, not to be confused with today’s navigational tool). After toiling and sweating it out to get their collective brain back in order, the scientists make a pact with their resuscitated machine such that, as long as the computer never again becomes antisocial, they shall forever obey it. All in all, Agee uses this scenario as a soap box upon which to pontificate his social and cultural views. On the whole, it’s a fascinating little read and one can only imagine what might have been if this satire/parody/social commentary did finally make it to the screen. The end result of Agee’s efforts is a treatment with a message that withstands the test of time. It’s a story that could be fleshed out and, with a few tweaks, primarily a reworking of the main character in Chaplin’s absence, turned into a movie even now. Agee’s smart, biting material would fall nicely into the artistic vision of Terry Gilliam or Jean-Pierre Jeunet.